Hi Artists!! Yes, you are an artist! Don't sell yourself short....get out the journal and paint, draw, doodle....just do whatever comes to mind! It doesn't have to be perfect...experiment with different techniques and mediums...find out what you like and don't like. I belong to a group of ladies, Journal 52, it's free and each week a prompt is given with an example of a technique and page, you are free to interpret any way you like. 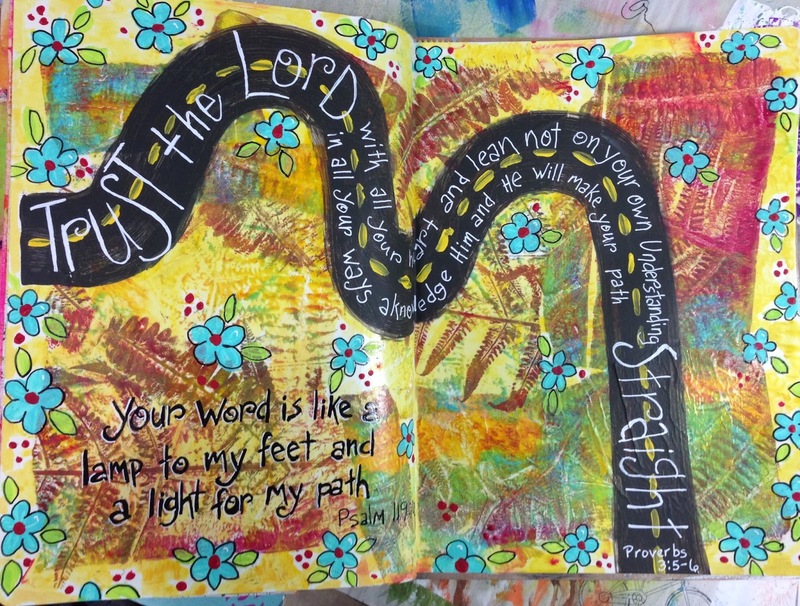 The first week for the year was Pathways.....and the top bible verse is my favorite Bible verse, so there it was....and as I was running this morning came the idea for the road. I started with a couple of deli paper gelli prints from my stash and Mod Podged them down, then started painting....wasn't sure at first that I liked it, but I kept going and am really happy with the way it came out......don't be intimidated by the blank page, just put something on it and see where it takes you!